Jason is the Founder and CEO of GORUCK, which manufactures gear in the USA and executes over 900 endurance events per year led by decorated combat Veterans of Special Operations. Jason holds a B.A. in Economics from Emory University in Atlanta, where he was Phi Beta Kappa and a two-time Academic All-American for Tennis. He is a 2006 Graduate of the Special Forces Qualification Course and recipient of a Bronze Star and Army Commendation Medal with “V” Device earned while serving on ODA 042 during Operation Iraqi Freedom in 2007. 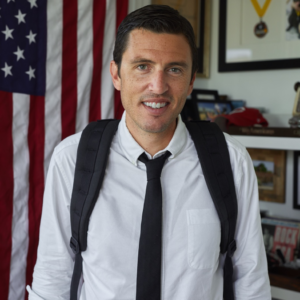 After founding GORUCK in 2008, Jason got his MBA from Georgetown University in 2011, where he was a John F. Connelly Scholar. Jason has supported the Green Beret Foundation since inception by raising several hundreds of thousands of dollars for the foundation and every year graciously donates GORUCK GR1s for the foundation’s Casualty Support Program. He lives in Atlantic Beach, Florida with his wife Emily, their three kids, and celebrity rock star dog, Monster.